Black body, 6.2 inch super AMOLED, bigger than S8, Quad HD resolution of 2960×1440. Battery life is for 4 hours if actively used...more if the usage is normal. Screen is made of bezels for better display quality. Doesn&apos;t lag easily. Bixby is amazing, you can select a picture and get similar images to it and many more things that I&apos;ve yet to explore. No buttons on the screen so a bigger display. Samsung pay, wherein you can use your phone like a credit card. This next generation device is expected to include a swathe of extras such as a giant edge-to-edge display, faster processor and improved battery life plus wireless charging. A new and improved dual-lens rear camera could also bring augemented reality to the device. This claims to be the best Samsung has made till date as it’s too good to be true. It has an Iris scanner which makes it unique along with a fingerprint sensor at the back. It’s super fast because of it’s great processor and RAM. This is the best android phone out there the screen is absolutely stunning and new features just make it more attractive only one thing i didn&apos;t like was the placement of the finger print. The curved edges bezel-less display is the best made by Samsung. The iris scanner feature is all-new. I personally love the beauty of it’s camera. If you’re looking for a new android phone, this should be at the top of your list. 36 Pricebaba users have written their experience with Samsung Galaxy S8 Plus. If you own Samsung Galaxy S8 Plus, please do leave your feedback too. Lowest price of Samsung Galaxy S8 Plus price in India starts at Rs. 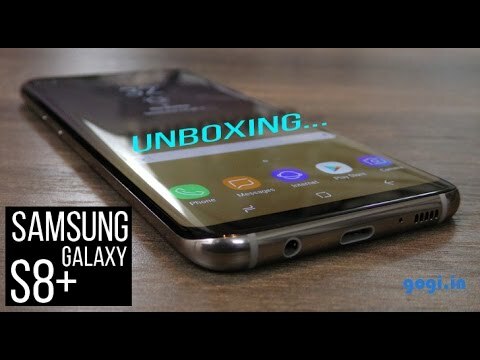 53,990 Samsung Galaxy S8 Plus is available on Flipkart at Rs. 53,990. Prices updated on 25th April 2019. Samsung Galaxy S8+ is this year's most-awaited flagship smartphone by the company. The successor to last year's Galaxy S7 edge, the Galaxy S8+ comes with a dual edge curved display, something Samsung calls "Infinity Display," with very thin bezels. The Samsung Galaxy S8+ comes with a 6.2-inch Super AMOLED screen featuring 2960 x 1440 pixels Quad HD resolution. The display further embraces a protective layer of Corning Gorilla Glass 5 on the front. For security, Samsung now offers Iris scanner and facial recognition in addition to several other standard features like a fingerprint scanner, pattern lock, and password. The device is IP68 rated dust and water resistant and runs Android Nougat operating system out of the box. Furthermore, the Galaxy S8+ packs a 3500mAh battery.Interestingly enough, a home button is now embedded underneath the display with some haptic feedback whereas the fingerprint scanner is moved to the back next to the camera. On the camera front, the Galaxy S8+ houses a 12-megapixel dual-pixel rear camera and 8MP selfie camera. Inside are a 10nm octa-core Samsung Exynos processor, 4GB RAM, and 64GB internal memory. The storage is further expandable up to 256GB using a microSD card support. The Galaxy S8+ also has a separate dedicated button to trigger Bixby — Samsung’s response to Google Assistant and Apple Siri. It’s a whole new ecosystem that will connect across different devices, services, and apps.